‘Follow the local custom when you go to a foreign place’. Blackjack is the card came which is described to be interesting and not very difficult to play both for beginners and professional players, that is why it has so many fans all over the world. Professional players strongly recommend you to learn different tips and strategies of blackjack and casino bonus codes to have more chances for beating a dealer; and you should try to learn not only a traditional variant of blackjack but also its widespread variations: remember that the rules of blackjack depend also on its variant. One of blackjack variants is a such-called Chinese Blackjack which is very popular at South-East Asia. They also call it Ban-Luck or 21-Point and it does not matter how many players are at the table to play it; but if there are no limitations of players’ number, restrictions can be found at the number of decks used for Chinese Blackjack: no more than 2 decks of cards can be used here. The rules of Chinese Blackjack are practically the same with ones of the conventional blackjack. Players also try to beat a dealer, they also should try not to exceed 21 points and they also bust and lose all their bets if they exceed 21. 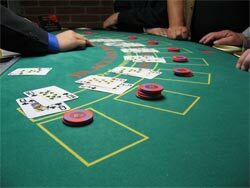 But there are also some particular rules of Chinese Blackjack exist both for players and dealers. An interesting fact is that any of players can be a dealer during a game and dealers can change each other: for example each player can deal a round and next round will be dealt by another player. There is also a little bit different counting system of card values at Chinese Blackjack. The number of points for an Ace depends on how many cards you have been dealt: two (2), three (3) or four (4). This variant of blackjack has its own card combinations and names for them. So, if you are interested in Chinese Blackjack it is better for you to learn all its rules and nuances; anyway, it is only one of many blackjack variants and it would be not bad to learn these variations to decide for yourself which of them you would prefer to play.